WHAT PERSONAL INFORMATION DOES COMPANY COLLECT? The information we gather from customers enables us to personalize and improve our services, and to allow our users to set up a user account and make purchases via the Website and PayPal. We collect the following types of information from our customers. We receive and store any information you enter on our Website or voluntarily provide to us in any other way (via, for example, signing up as a member or for our newsletter, leaving comments, or a submitting a Contact form). The types of Personal Information collected may include your name, email address, gender, zip code, country, IP address, browser information, and, if you make a purchase through our Website, your credit card number, credit card security code, expiration date, billing address, and shipping address. On our Website you are able to create a user profile, which allows you to create a user name and password, as well as provide information like your Twitter account. We will store the user name, but your password will not be visible in our records. You can choose not to provide us with certain information, but then you may not be able to take advantage of many of our special features, and you may not be able to complete a purchase through the Website. The Personal Information you provide is used for such purposes as allowing you to purchase items, improving the content of the Website, customizing the advertising and content you see, and communicating with you about specials and new features. We do not direct any of our content specifically to children. Users of our Website are required to be at least 16 years old, and any user under 16 is not an authorized user. Additionally, if we learn that a user is under 16 years of age, we will promptly delete any Personal Information we have collected about that user. We may receive information about you from other sources, if, for instance, you link your Facebook, Instagram, and/or Google accounts to your user profile. If you choose to link these accounts to your user profile, we will receive your name, email address, and profile picture associated with that account. We use the Disqus commenting system, so if you choose to comment on a Website post, your Disqus profile picture will appear, if you have one. We receive and store certain types of information whenever you interact with our Website or services. We automatically receive and record information on our server logs from your browser including your IP address, cookie information, the page you requested, and any items you may purchase. This information may be used to customize the content you see on our Website or to communicate with you about specials and new features. Usage information, such as the numbers and frequency of visitors to our site and its components, may also be used in aggregate form, that is, as a statistical measure, and not in a manner that would identify you personally. This type of aggregate data enables us to figure out how often customers use parts of the Website or services so that we can make the Website appealing to as many customers as possible, and improve those services. As part of this use of information, we may provide aggregate information to our partners about how our customers, collectively, use our site. We share this type of statistical data so that our partners also understand how often people use their services and our Website, so that they, too, may provide you with an optimal online experience. We never disclose aggregate information to a partner in a manner that would identify you personally. Our Website uses Google Analytics Demographics and Interest Reporting to track demographic information. If you would like to opt out of this, please use this link. We may receive a confirmation when you open an email from us if your computer supports this type of program. Company uses this confirmation to help us make emails more interesting and helpful and improve our service. If you do not want to receive email or other mail from us, please indicate your preference by making a modification on your account page, or by using the “Unsubscribe” feature in any email we send to you. Cookies are small data files stored on your browser by this Website to enable our systems to recognize your browser and tell us how and when pages in our site are visited and by how many people. Company cookies do not collect Personal Information, and we do not combine the general information collected through cookies with other Personal Information to tell us who you are or what your screen name or email address is. Most browsers have an option for turning off the cookie feature, which will prevent your browser from accepting new cookies, as well as (depending on the sophistication of your browser software) allow you to decide on acceptance of each new cookie in a variety of ways. Additionally, already-set cookies may be deleted at any time via your internet browser or other software program. However, if users deactivate the setting of cookies in your Internet browser, not all functions of our Website may be entirely usable. Affiliated Businesses We Do Not Control: We are affiliated with a variety of third-party businesses and work closely with them. In certain situations, these businesses sell items to you through our Website. In other situations, we provide services, or sell products, jointly with affiliated businesses. You can recognize when an affiliated business is associated with your transaction, and we will share your Personal Information that is related to such transactions with that affiliated business. Google Analytics: Used to track Website usage and share with us information such as referring websites and user actions on this Website. Google Analytics may capture your IP address, but no other personal information is captured by Google Analytics. Employees: We restrict access to your Personal Information to those employees who need to know that information to provide products or services to you. Business Transfers: In some cases, we may choose to buy or sell assets. In these types of transactions, customer information is typically one of the business assets that is transferred. Moreover, if our Company, or substantially all of its assets, were acquired, or in the unlikely event that our Company goes out of business or enters bankruptcy, customer information would be one of the assets that is transferred or acquired by a third party. You acknowledge that such transfers may occur, and that any acquirer of our Company may continue to use your Personal Information as set forth in this policy. Protection of our Company and Others: We may release Personal Information when we believe in good faith that release is necessary to comply with that law; enforce or apply our conditions of use and other agreements; or protect the rights, property, or safety of our Company, our employees, our users, or others. This includes exchanging information with other companies and organizations for fraud protection and credit risk reduction. Our Website engages in affiliate marketing, which is done by embedding tracking links into content on this Website. If you click on a link for an affiliate partnership, a cookie will be placed on your browser to track any sales for purposes of commissions. 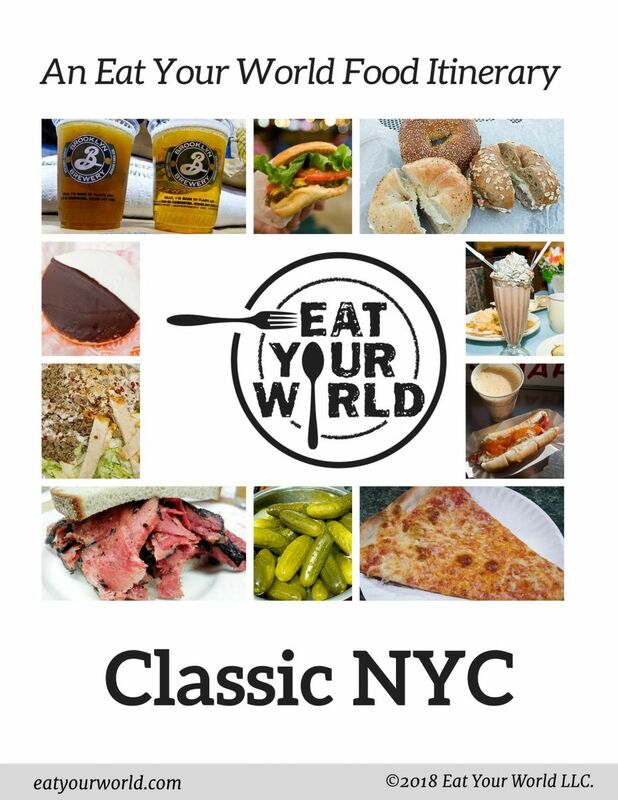 For example, Eat Your World is currently a participant in the Amazon Services LLC Associates Program, an affiliate advertising program designed to provide a means for sites to earn advertising fees by advertising and links to Amazon.com. As part of this Amazon Associates program, this Website will post customized links, provided by Amazon, to track the referrals to their website. This program utilizes cookies to track visits for the purposes of assigning commission on these sales. Such links will always be openly disclosed to readers. Your user account Personal Information is protected by a password for your privacy and security. You need to prevent unauthorized access to your account and Personal Information by selecting and protecting your password appropriately and limiting access to your computer and browser by signing off after you have finished accessing your account. When our order form asks users to enter Personal Information such as a credit card number, that information is encrypted with industry-standard Secure Socket Layers (“SSL”) encryption to keep your online order safe and secure. When the letters “http” in the URL address change to “https,” the “s” indicates you are in a secure area employing SSL. Company also maintains physical, electronic, and procedural safeguards that comply with federal regulations to protect your Personal Information. Company endeavors to protect user information to ensure that user account information is kept private, however, Company cannot guarantee the security of user account information. Unauthorized entry or use, hardware or software failure, and other factors, may compromise the security of user information at any time. We allow you to access the following information about you for the purpose of viewing, and in certain situations, updating that information. This list may change as our Website changes. As stated previously, you can always opt not to disclose information to use, even though it may be needed to take advantage of certain Website features, including the ability to purchase items and set up user profiles through the Website. You are able to add or update certain information on pages, such as those listed in the “What Personal Information Can I Access” section above. When you update information, however, we may maintain a copy of the unrevised information in our private records. If you have any questions or concerns regarding privacy at our Website, please send us a detailed message to [email protected], and we will make every effort to resolve your concerns.